OLB Coach Porter Impressed With Dupree | "IT'S A STEELERS WORLD"! Unlike last years so far unsuccessful drafting of Jarvis Jones, Alvin “Bud” Dupree seems to be impressing the Pittsburgh Steelers in more ways than one. 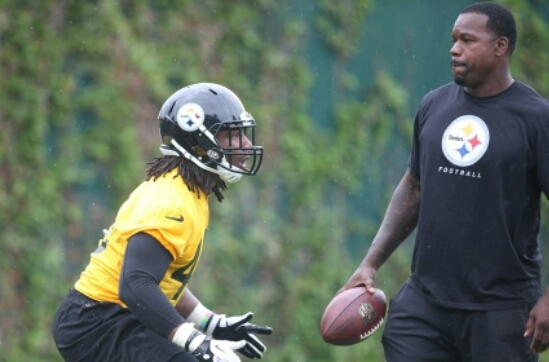 Not only has Dupree impressed the Steelers on the practice field, the 6’4″.. 270lb..4.5 40 running Dupree has done it in outside linebacker meetings too. But more importantly he has impressed outside linebackers coach Joey Porter with the good questions he’s asked. High praise coming from one of the most talented and feared outside linebackers to follow in the likes of Greg Lloyd and Kevin Greene. Not to mention a confidence builder for Dupree as well. Of course it’s not a lot. It’s doing exactly that he did to get to the point he is now..”play football “..and from the sound of it the 22nd pick overall in the 2015 NFL Draft is doing just that. Dupree finished his career as one of the best defensive players in recent program history. He came to Kentucky as a tight end but quickly moved to defensive end and thrived in a hybrid defensive end/outside linebacker role as a Wildcat. Dupree finished his Kentucky career ranked second in program history with 23.5 sacks and added 235 tackles with 38 tackles for loss. As a senior, Dupree totaled 74 tackles, 12.5 tackles for loss, 7.5 sacks, two fumbles forced, a blocked kick and an interception.